Oh Soo was abandoned in front of an orphanage as a baby. Later on, he lost his first lover. Now, Oh Soo works with Jin-Sung (Kim Bum), who looks up to him. Meanwhile, there’s another man named Oh Soo who takes care of Oh Soo’s residence and cooks for him. One day, the employee Oh Soo tells Oh Soo and Jin-Sung that his father is the CEO of PL Company and he has a young sister named Oh Young. Oh Soo and Jin-Sung doesn’t take him seriously. Oh Soo is in a relationship with actress So Ra (Seo Hyo-Rim). She’s obsessed with Oh Soo, but he doesn’t love her nearly as much. So Ra is about to go abroad for one year for work and she’s afraid Oh Soo will leave her for another woman during this time. She concocts a scheme to frame him for embezzlement. Meanwhile, Oh Young’s father is the CEO of PL Company. She is the heir to the company but lives a lonely existence. She is blind and separated from her mother and brother after her parents divorced when she was 6-years-old. Now her father is gravely ill. She doesn’t trust anyone, especially Secretary Wang Hye-Ji (Bae Jong-Ok), who caused her parents to divorce. One day, Oh Young receives a letter from her older brother Oh Soo. From the mailman, Oh Young learns that her brother has sent her letters regularly and her stepmother Hye-Ji has hidden those letters. Oh Young then decides to visit her brother without telling her stepmother. She takes a taxi and asks to be driven to the address written on her letter. The address turns out to be a residence hotel. Oh Soo wakes up from the sound of his doorbell ringing. He sees a woman standing outside of his room. She tells him that she is “Oh Young,” but Oh Soo doesn’t recognise her. She then asks him who he is and he tells her that he is Oh Soo. Meanwhile, Oh Soo realises that she is looking for the other Oh Soo. He tells her that her brother is at an institute and will be back by 3 pm. Oh Soo then goes back to sleep. When he wakes up and checks in the lobby, he sees that the woman is still there. Oh Soo approaches her and she asks him to read the letter sent by her brother. Oh Soo now realises that she is blind. He takes her outside of the hotel and reads the letter to her. While reading the letter, he notices a group of guys running towards to him. Instinctively, Oh Soo gets up and runs. While Oh Soo is running away, his employee Oh Soo appears and begins to follow him. Shortly later, employee Oh Soo is fatally hit by a car. Oh Soo is then caught by the guys chasing him and Oh Young is standing nearby hailing a taxi cab. She is unaware that her older brother Oh Soo has just died in front of her. Oh Young is leaving because she just received a phone call that her father has passed away. While Oh Soo sits in prison, So-Ra and her lawyer visit him. They explain to Oh Soo why they set him up. She tells him to spend a year in prison and then live with her in Switzerland for good. She has about 7 million dollars from the embezzlement scheme. Oh Soo tells her that he won’t ever go back to her, even if he is killed by the person she swindled. One year later, Oh Soo is now out of prison. He learns that he has no money left and that So-Ra’s sponsor has hired a gangster Moo-Cheol (Kim Tae-Woo) to get back the 7 million dollars he believes Oh Soo stole. Moo-Cheol tells Oh Soo that he has to come up with the money in 100 days or he is dead. Oh Soo doesn’t have a place to stay so he goes to the rooftop room where his employee Oh Soo lived. While standing in front of the rooftop room, a man approaches Oh Soo and asks if he is Oh Soo. After confirming that he is Oh Soo, the man named Jang Sung (Kim Kyu-Cheol) identifies himself as the company attorney for PL Company and a friend of the late company president. He has been searching for Oh Soo because his blind younger sister Oh Young is all alone. The attorney believes Oh Soo is Oh Young’s older brother. Meanwhile, Oh Soo realises this is could be the way he can repay the money. Seriously, That Winter, the Wind Blows is one of the best TV series that I’ve ever watched. Mainly because the main male character portrayed by Jo In-Sung is incredibly sweet and gentleman! Not to mention Song Hye-Kyo looks very beautiful as always. Their performance is just awesome! This Korean drama has become one of my favourite Asian dramas. Period. Should I even list what makes me feel so in love with the series? Yep, I think I should. Before I actually write the overall review, I’ll let you know the things that make me fall in love with this Korean drama. So let me remind you, this review will be a bit longer than usual. I guess those pictures have already summed up nearly everything. How sweet Oh Soo towards Oh Young, despite he’s pretending to be her brother, but he does truly and genuinely care about her. Their small acts can make your heart melt even more and more. I think I always like men that do small actions often, rather than big actions but just barely. I think Oh Soo is that man. Like I’ve said in Hunter x Hunter (2011), I always want a brother and seeing how Oh Soo treated Oh Young, I know I want a brother even more. Although it’s impossible, but a girl can dream, right? With that wish in mind, I think that’s the reason why I really like Oh Soo, because I really want a brother like him. Those small acts like a kiss on the cheek or a kiss on the head or a kiss on the forehead. When Oh Soo explained to Oh Young about the situation around them, planting flowers and playing together, when Oh Soo warmed up Oh Young’s hand, when Oh Soo helped Oh Young baked a cake and helped her cool down her fingers when she accidentally touched the hot pan, when Oh Soo accompanied Oh Young who can’t sleep that night. All those small acts are definitely really really sweet! Who doesn’t want to be treated like that? I think the bell has become an icon of That Winter, the Wind Blows. At first, Oh Soo gave Oh Young a bell when they were in a play park. Later on, Oh Young gave Oh Soo a birthday present, a bracelet with bells on it. It’s sweet and cute. Yep, the bells are definitely an icon of this drama. I think a kiss on the forehead or on the head is the sweetest thing ever. Oh Soo does that sometimes, and some other times he will stroke and ruffle Oh Young’s hair. I think it’s so sweet. I always like that kind of actions and seeing Oh Soo doing it makes me like him even more. I think their actions are sweet and not exaggerating at all. They’ve put good portions of those kinds of little things. Oh Soo always does small things that will help Oh Young, in every way he can. 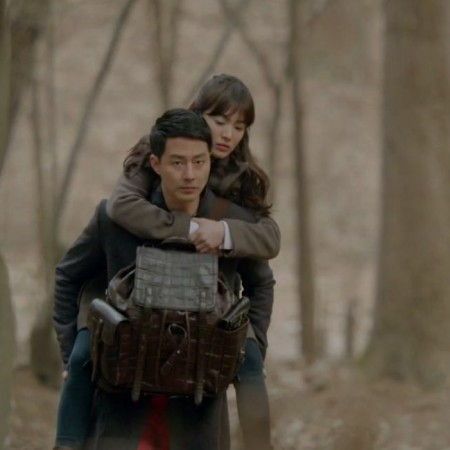 Oh Soo always carries Oh Young around whenever she needed and let her walk by herself whenever she needed it too. I think his understanding towards her is remarkable. He knows what he’s doing and what to do at the right moment. Jeez, I just can’t stop talking about how sweet he can be. Like seriously. Their relationship is just right, in every portion. Not too much but not too little. Everything is just right. Even though it all started with a lie, but the development of their relationship is not a lie. Oh Soo really cares about Oh Young. I guess that’s enough pictures to show what I’ve meant, right? How sweet and gentle Oh Soo is, despite his first intention. It’s not how you started it, it’s how you finished it. So they say. I know it’s a classic thing, but still, their relationship can make you envy. Well, at least I do. They’re not too much, but it still touches and melts your heart. Their relationship is indeed a relationship goal—at least it is for me. Actually, there are more pictures that I want to show, but too many will make me like spoiling everything. So I better stop the pictures now. While Descendants of the Sun (2016) is mainly more cheerful and more action and more heroic, the story of this series is sweeter in a matter of small actions. While Descendants of the Sun gives us many romance, many comedy, and many heroic and medical action, That Winter, the Wind Blows gives us more romance and drama. It’s romantic and sweet. The small actions by Oh Soo towards Oh Young are just sweet and very gentleman, while Si-Jin looks more of heroic since he’s a soldier, but he did do sweet actions too towards Mo-Yeon. Both dramas are very different that you can’t even possibly compare them. That Winter, the Wind Blows will make you shed some tears and also make you smile. It’s that good. I think it’s mostly because Jo In-Sung and Song Hye-Kyo are both great actor and actress that we can actually feel what their characters feel and their emotions. You can cry just because you see them crying. Jo In-Sung really has his charisma, while Song Hye-Kyo is always as beautiful as ever. After a few years didn’t do any TV dramas, she came back with this amazing role. She really knows how to pick a role. Same goes to Jo In-Sung, even though I have never watched any of his drama before. Both Jo In-Sung and Song Hye-Kyo are just superb. Jo In-Sung even didn’t afraid to cry a lot in this series. He cried naturally and so did Song Hye-Kyo. That Winter, the Wind Blows is actually playing your emotions quite a bit. Even when you hate the antagonists, there are times when you will feel sorry for them. You just can’t help it. And sometimes, you can feel annoyed by the protagonists. In the first few episodes, I was confused whether this or that character is good or bad. I know that not every bad person shows the sign at first, but seriously when you think he or she is bad, he or she did something good and vice versa. Then they can make you cry so many times as well. Now you know what I meant of playing our emotions, right? As for the overall story, That Winter, the Wind Blows is really good though at first perhaps you’re going to feel a little bit bored because of its kind of slow pace. Though afterwards, you’ll know that this is a great drama. The major problem that I have with this Korean drama is, of course, the ending. Yes, ending again. I don’t know why I always have a problem with the ending—well, not always, but I think most of the time I’ve complained about the ending. It’s not like the ending is not happy, but to me, it’s kind of ambiguous. How the director took the scene made us wondering is it real or is it a dream? There are some things that need to be explained. I have to watch it twice—or is it three times? or even four?—to really understand it. And I think I still hope for a better one. Nevertheless, it’s still a happy ending and I should feel satisfied by it. I’ve been considering whether I should give That Winter, the Wind Blows a 9 or 9.5 stars, but then I love this drama too much—or perhaps I love the character of Oh Soo—and my love for it—or him—can overlook the minus part of this TV series. That’s why I decided to give That Winter, the Wind Blows 10 out of 10 stars.